New Delhi: The metro rail network in the country is increasing with the mass rapid transit system emerging as one of the best solutions for urban transportation. Even as eight metro rail networks covering a length of 370 km are operational in the country, over two dozen more projects are lined up. Out of the two dozen projects, around 15 are lined up with the urban development ministry. The cities that have lined up their plans include Pune, Nagpur, Ahmedabad, Chennai, Vijayawada, Kozhikode, Indore, Bhopal, Patna, Guwahati, Kanpur and Varanasi. A senior urban ministry official, on the condition of anonymity, said, “Success of Delhi-NCR metro brought enthusiasm in the state governments and they want to replicate the same in the cities with population of over 1 million. We are getting a lot of proposals and many of the state governments are also looking at public-private partnership (PPP) since urban transportation is a state subject." He added that Central assistance is given only to projects which are feasible. In the last three years, from 2014-2017, the urban development ministry sanctioned Rs30,653.78 crore, out of which only Rs12,345.33 crore was released to various metro rail companies in the country. Similarly, in the current fiscal year, the ministry allocated around Rs17,960 crore for metro rail companies and till the first quarter ending June only Rs4,650 crore was spent. The figures are for Uttar Pradesh, Maharashtra, Gujarat, Rajasthan, Tamil Nadu, Kerala, Karnataka, Maharashtra and Delhi-NCR region. However, officials from states like Punjab and Madhya Pradesh, which are yet to get approval for the first metro projects in their states, said that there has been a huge delay from the Centre for their projects. Some of these states are ready for the PPP route too. A senior Punjab government official, who didn’t want to be identified, said, “We have submitted two metro proposals for Amritsar and Ludhiana, both high-density areas where such a mass rapid transit system would be a success. However, none of them has been approved. We will see for some more time and are also open to PPP route for development of metro system." Metro rail projects are capital intensive and are generally undertaken through financial support of both the central and state governments in the form of equity and grants. The remaining funds are raised through multilateral agencies like Japan International Cooperation Agency (JICA) and European Investment Bank (EIB). The urban development ministry official said, “States should learn to be open to use their own resources and reduce dependence on centre. In the recent months we have simplified provisions for state public sector undertakings to directly tap bilateral agencies for resources for infra development in their states." He added that the new fund-raising route will allow for direct borrowing from official development assistance partners in countries like Japan, the US and Germany. 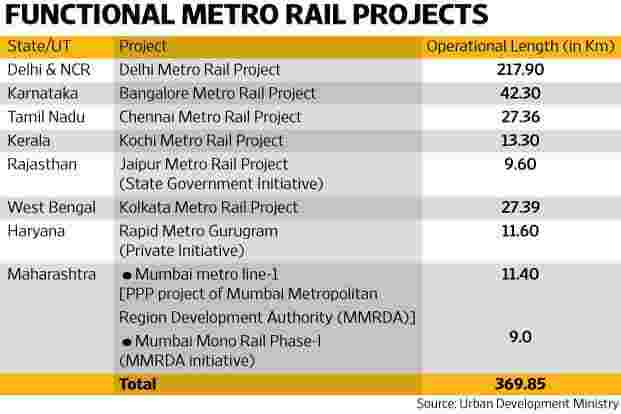 Interestingly, PPP for metro projects has been limited to five in India. Out of these five, one project (Mumbai Metro Phase 2) was terminated before it started, while another (Delhi Airport Line) was terminated after becoming operational. Currently, there are three operational PPP-based metro projects (one in Mumbai, and two in Gurugram) while one project is under implementation (Hyderabad Metro). Shubham Jain, vice-president and sector head for corporate ratings agency ICRA, said, “The PPP participation in metro rail projects has been limited thus far, to encourage PPP would require adequate risk allocation in the concession agreements, availability of low cost debt funding, and the presence of a robust dispute resolution mechanism." ICRA in its report has estimated that in the next five years, metro rail projects worth Rs2 trillion are likely to come up for bidding.